Liberty’s Ben Roderick slices to the hoop between a trio of Westerville South defenders during the first half of Thursday’s OCC showdown in Powell. Olentangy Liberty junior Ben Roderick scored eight of his game-high 28 points during a 13-0 run to end the third quarter. 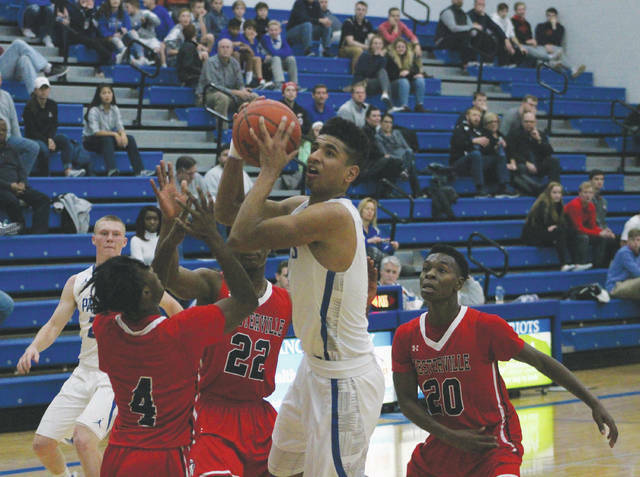 The Patriots (1-2, 1-1) were able to hold off Westerville South in the fourth quarter to win 61-58 in OCC-Buckeye boys basketball action Thursday night in Powell. The Wildcats trailed by as much as seven in the final minute. Roderick rebounded and dunked a missed Nick Nakasian shot, but was called for a technical foul for hanging on the rim with 1.3 seconds left in the game. Joey Thatcher had 12 points. He hit five of six free throws in the fourth quarter to help keep Liberty afloat. Manny Sunnyway, who led the Wildcats with 20 points, made both free throws on the technical. But, Jordan McMillian’s deep three-pointer missed wide right at the buzzer. Liberty trailed by as much as five points in the third quarter. Mitchell Okuley missed a three and had the rebound tipped to him by teammate Grant Wilson. He found a lane and laid it in to cut the deficit to 38-35 with 3:33 left. Wilson scored on Liberty’s next possession and Okuley knocked down a free throw to tie it. That’s when Roderick took over. He buried a three from the left wing to put Liberty on top and followed with an and-one before finishing off the third quarter with a basket from underneath to give the Patriots a 46-38 lead. Sunnyway beat the halftime buzzer to tie the score at 29-29 after a back-and-forth first half. It followed a Hafiz Turay basket to help South tie it after Liberty had its largest lead of the game to that point. The Wildcats led by as much as four in the opening frame before a Roderick three-pointer made it 14-13 at the end of one. McMillian had 16 points and Turay added 10 for the Wildcats (3-1, 1-1). Next, Liberty hosts Marysville in non-league action Tuesday night at 7:30 p.m.
https://www.delgazette.com/wp-content/uploads/sites/40/2017/12/web1_roderick2.jpgLiberty’s Ben Roderick slices to the hoop between a trio of Westerville South defenders during the first half of Thursday’s OCC showdown in Powell.